Maybe you’ve heard of Veganuary before? Or maybe you haven’t. Either way, it’s cool. Although I’ve been vegetarian for well over 25 years, I’m not vegan and probably never will be. Because: cheese. But I do like to try out new ways of eating, even if for a little while. I do this primarily because I want to be able to answer questions about different ways of eating in an informed way when someone asks me about them, but also because you never know how you’ll feel until you try. Case in point: I lasted approximately 5 minutes on a low-carb diet. But I tried! If you’ve been thinking of shifting towards more of a plant-based way of eating, Veganuary is a perfect time to try it out. 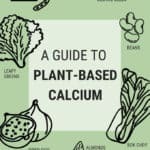 Basically, you eat plant-based for the month of January, and see how you like it. 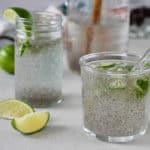 There are plenty of good reasons to eat more plants – they’re packed with important nutrients, loaded with dietary fiber, and you won’t find that many antioxidants and anti-inflammatory compounds anywhere else. 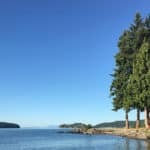 Eating more plant-based is also kinder to our planet (if it’s done right – it’s not a black and white issue by any means) and can be a really affordable way to eat. 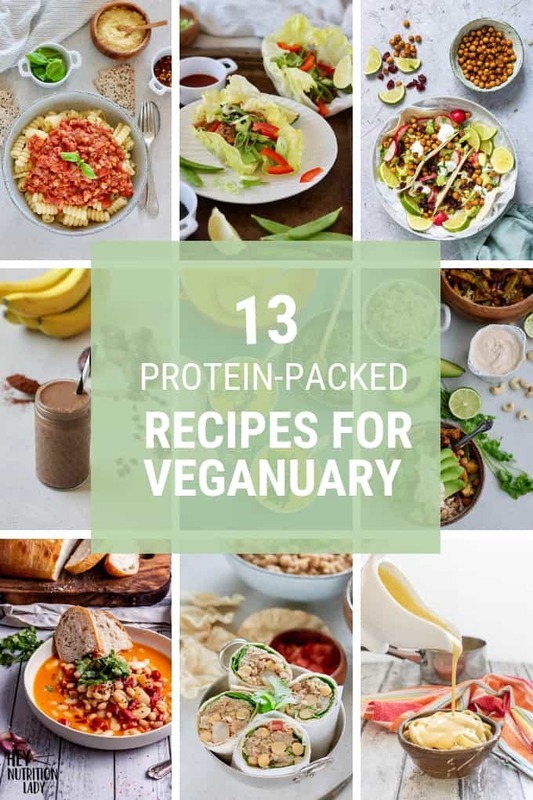 Do you have any tasty Veganuary recipes? 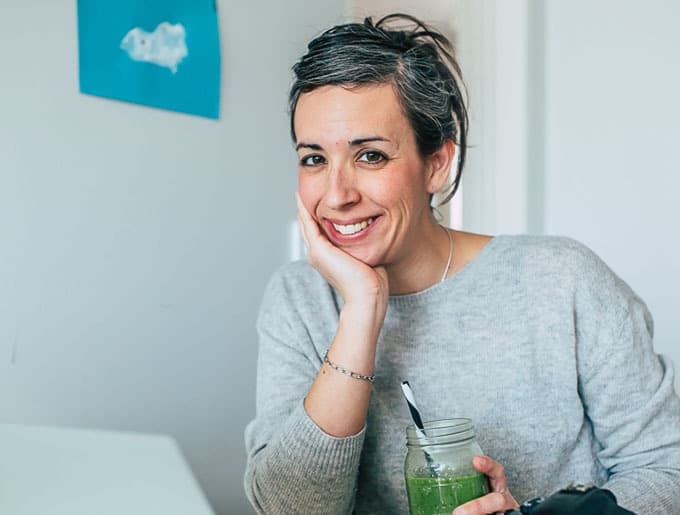 If you’re worried you’ll end up eating weird hippy food, bland tofu, and buckets full of quinoa, fear not! 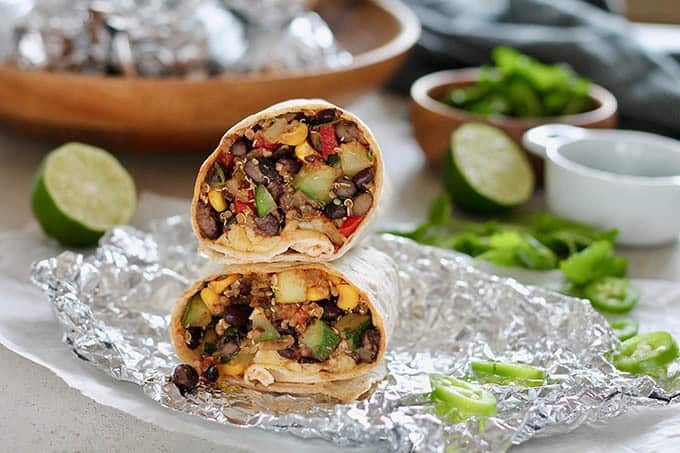 I’ve put together a list of drool-worthy and protein-packed Veganuary Recipes to get your plant-based mojo flowing. Let’s get into it! 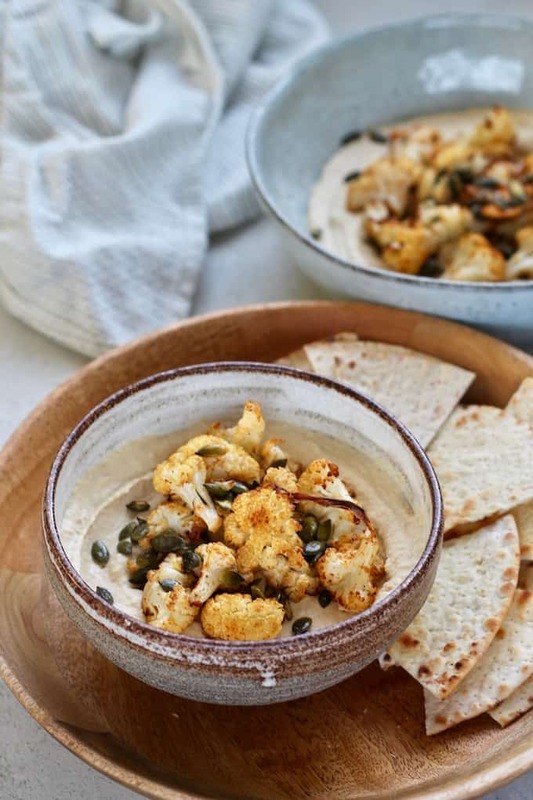 Try these Roasted Cauliflower Hummus Bowls: Protein-packed hummus topped with roasted cauliflower and toasted pumpkin seeds for a deliciously different meal. 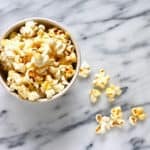 Perfect for picnics, parties, and packed lunches! 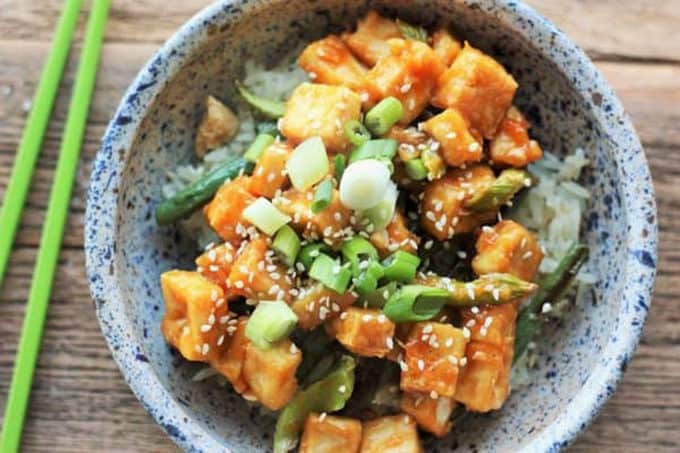 Crispy and easy Fried Tofu With Orange Sauce from Sustainable Cooks is a speedy weeknight dinner. 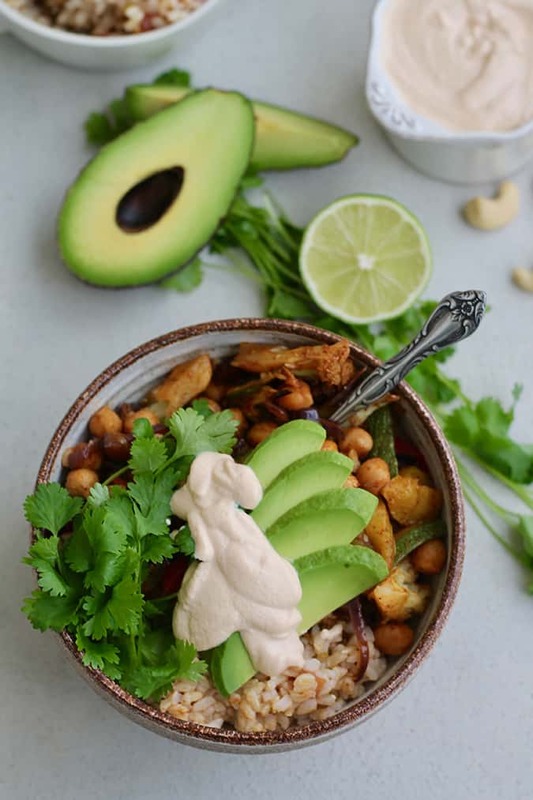 Made in the air fryer or in a skillet, this is the most delicious vegan recipe you can make in under 30 minutes. 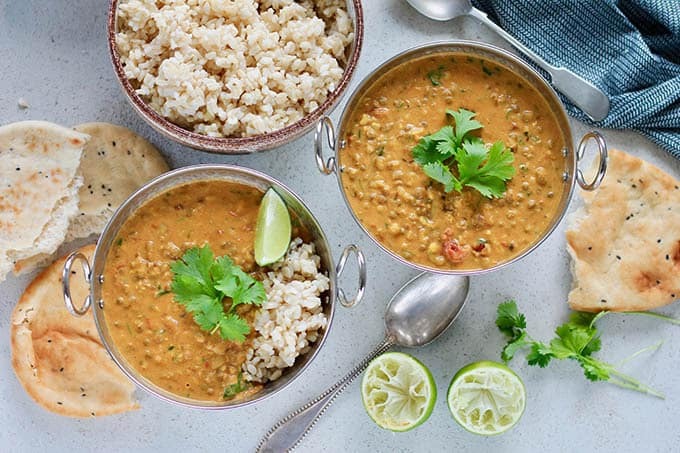 This tasty vegetarian and Vegan Green Lentil Bolognese from Happy Veggie Kitchen is the perfect weeknight dinner, packed with veggies and green lentils in a rich tomato sauce. This bolognese sauce is kid friendly and sure to win over anyone who tries it. 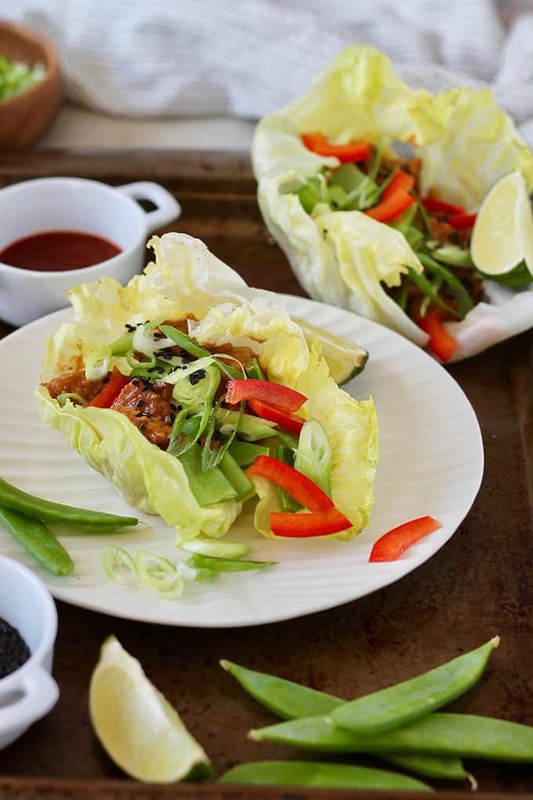 Try these Vegetarian Lettuce Wraps with Spicy Sesame Tempeh! 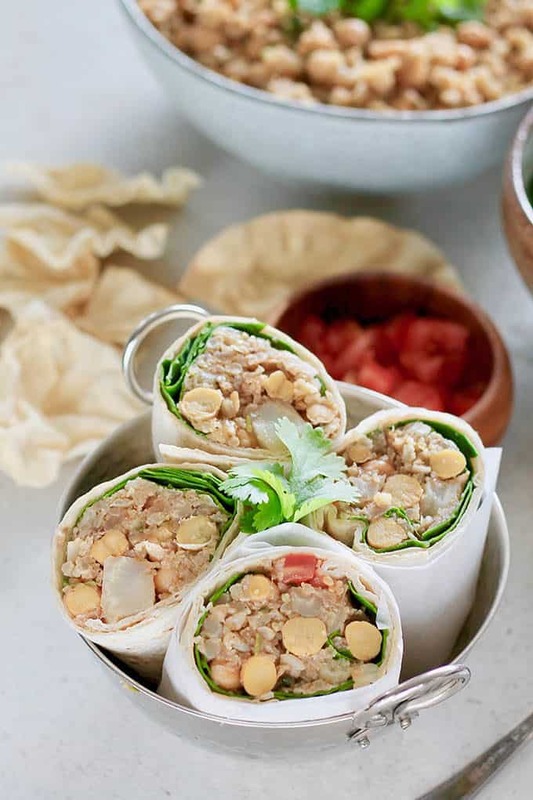 These crunchy vegan wraps are a healthy twist on a classic recipe, with tempeh for protein, a spicy sesame sauce for bold Asian flavours, and lots of crunch from fresh vegetables. 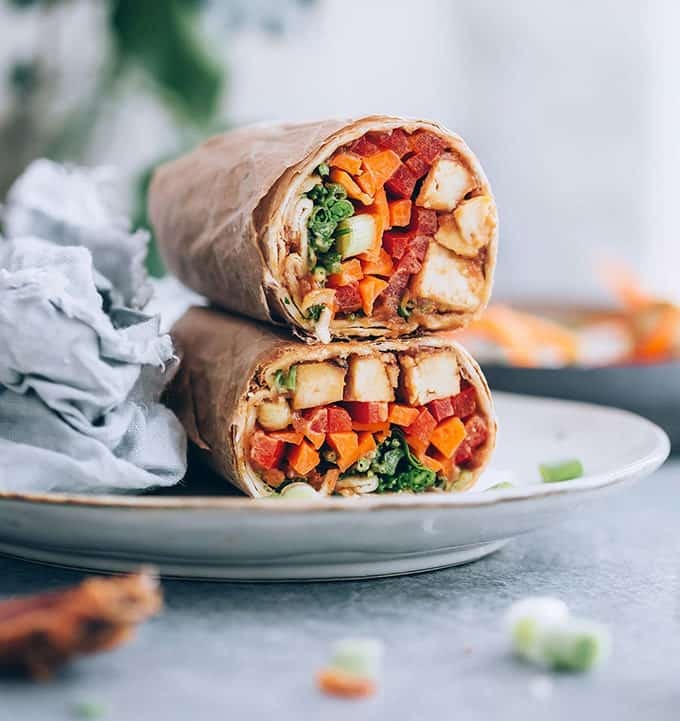 If you’re worried about what to pack for lunch during Veganuary, check out these protein-packed Ginger Peanut Tofu Wraps from Hello Veggie. 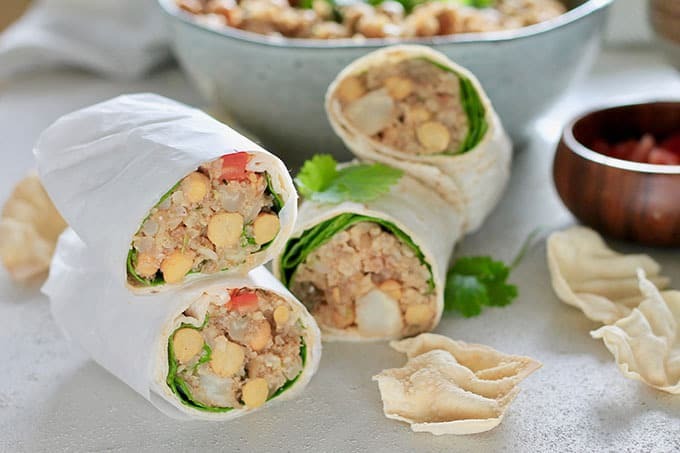 Wraps are pretty much the best kind of lunch because you get everything you need in one convenient package. It’s easy! Portable! Balanced! 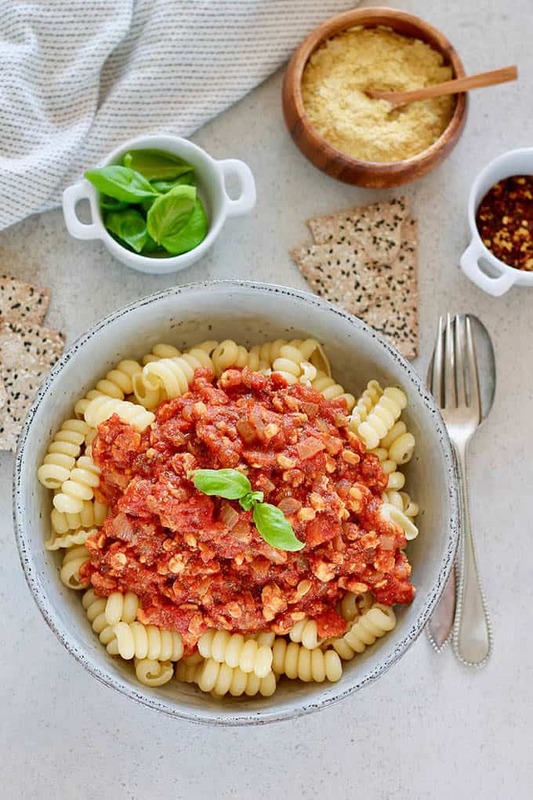 This easy vegan Tempeh Bolognese sauce is made with crumbled tempeh, nutritional yeast, and flavourful spices. 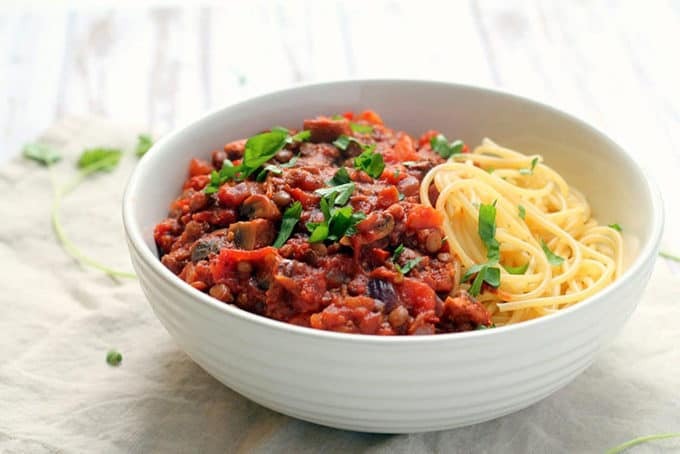 Done in under 30 minutes but with all-day flavour and packed with plant-based protein, this vegetarian bolognese sauce is the perfect quick and healthy weeknight dinner. 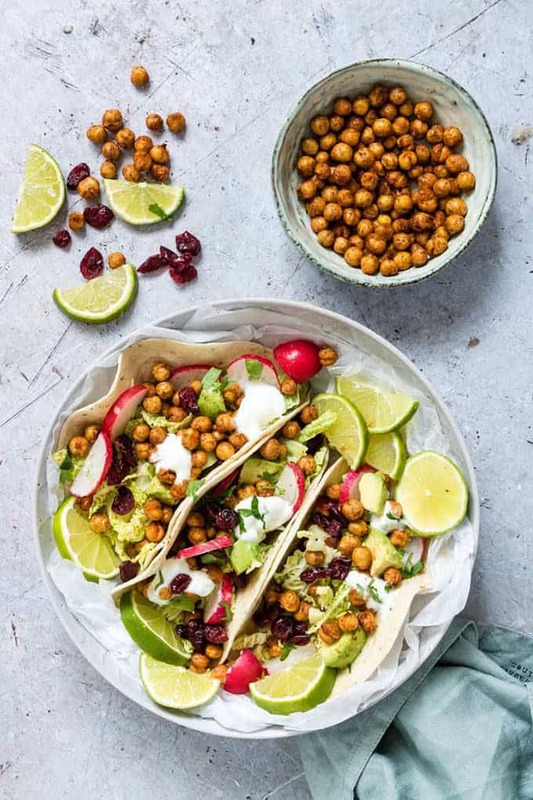 These delicious Chickpea Tacos from Recipes From A Pantry are flavourful, colourful and quick to whip up. It’s an easy vegetarian dinner that uses everyday pantry ingredients and is perfect for weeknight dinners! 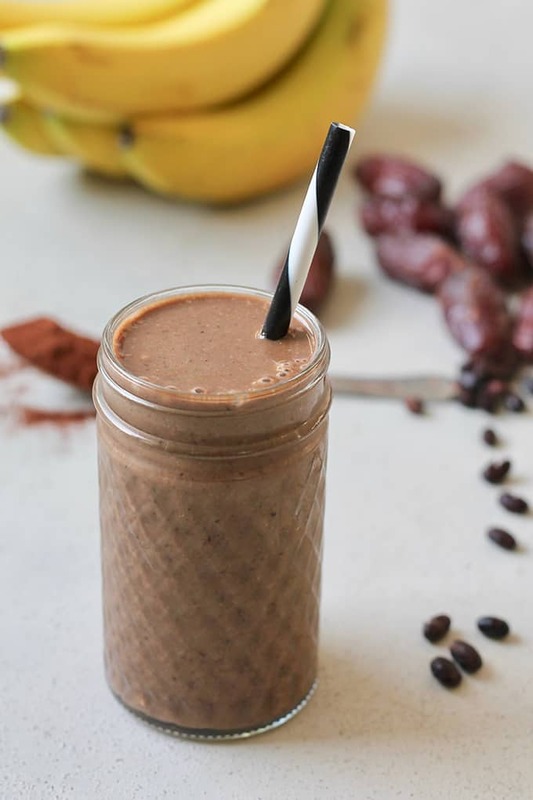 This Chocolate Black Bean Brownie Smoothie is a rich and creamy healthy chocolate smoothie loaded with protein thanks to a secret ingredient that you totally can’t taste – beans! 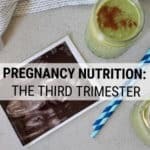 Naturally sweetened with just banana and dates, and vegan thanks to plant-based milk, this is a smoothie the whole family will love. 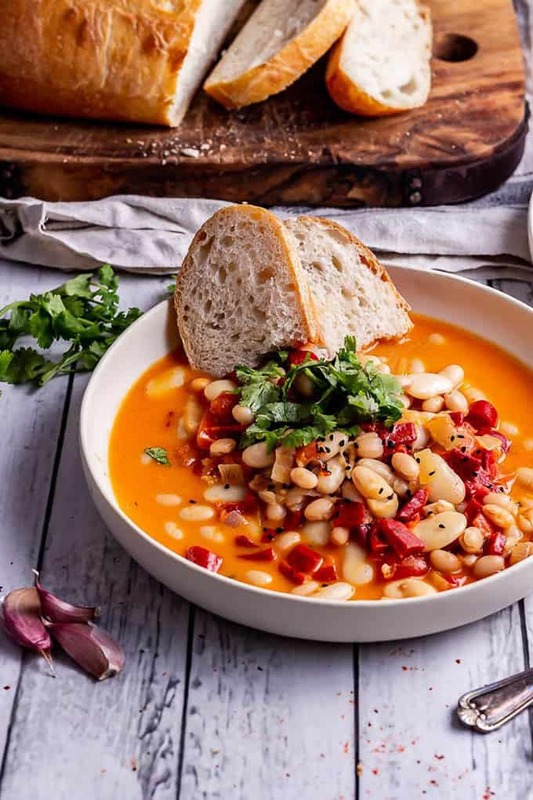 This gorgeous Roasted Red Pepper Soup from The Cook Report is rich and comforting thanks to the coconut milk and smoked paprika. 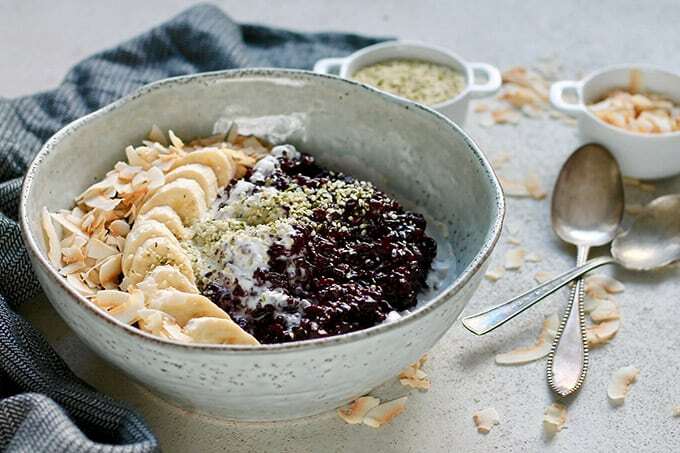 It’s a delicious winter warmer that’s suitable for vegans. 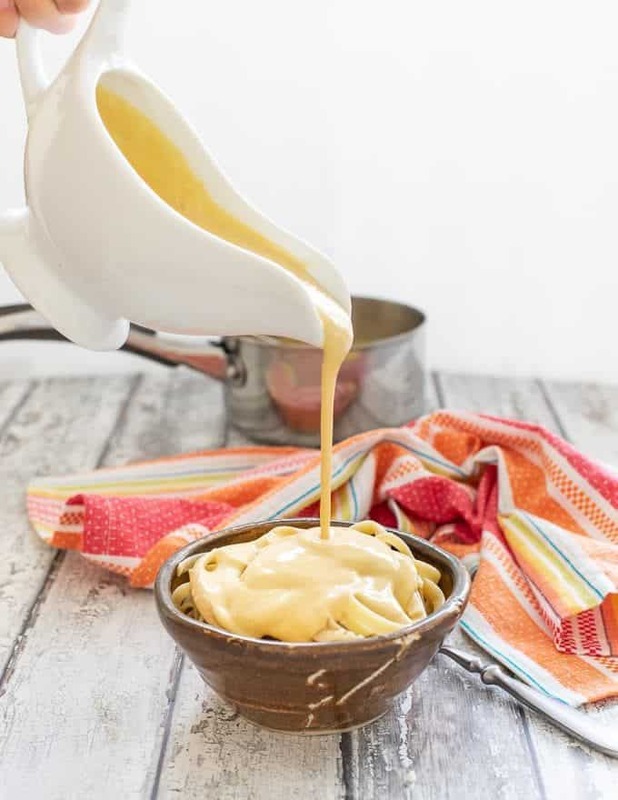 This silky smooth, lusciously creamy, Vegan Cheese Sauce from A Virtual Vegan is nut free, gluten free and really low in fat. 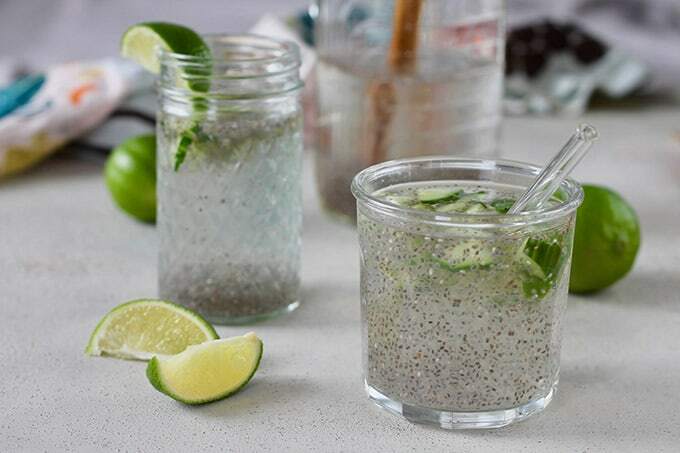 Whip it up in minutes in your blender! 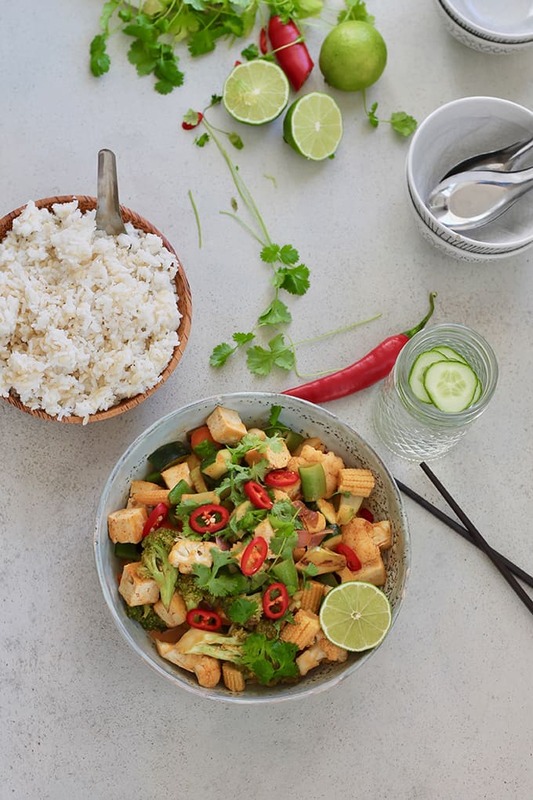 A red curry coconut stir fry loaded with vegetables and tofu. Quick, easy, and nourishing, you can have this simple meal on the table in under 30 minutes. These all look so good! 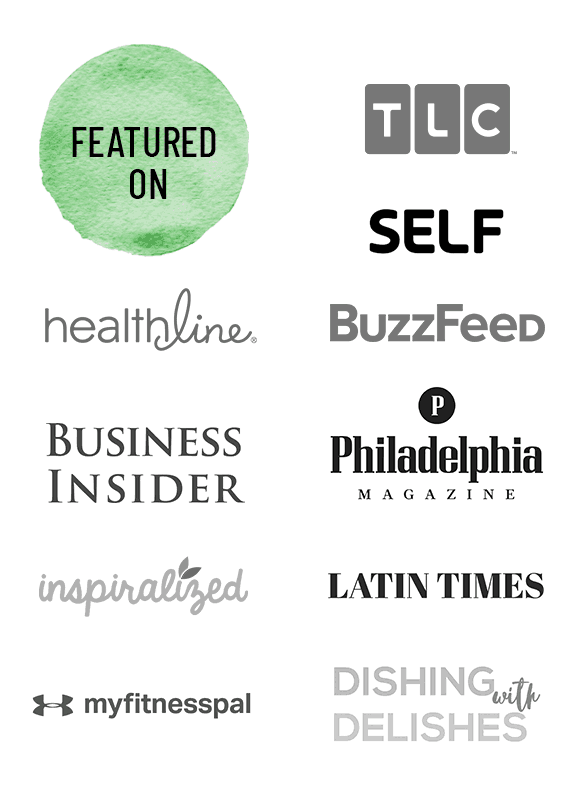 Thanks for including my Orange Tofu!